Since the great outpouring of support at the Ottawa demonstration in December against the imposition of the Indian Act on their community, a great many of things have transpired on Barriere Lake’s territory. Stronger than ever, the community is ready to fight back and needs your help. Please read the update posted below and stay tuned for ways to get involved. RAPID LAKE, QC – Last week, Barriere Lake community members discovered that Val D' Or based Cartier Resources has begun line-cutting in preparation for mining exploration on their unceded Aboriginal lands. According to their website, the mining company claims that their “100% owned” land base of 439 square kilometers boasts rich copper deposits ripe for exploitation. The so-called “Rivière Doré Project” was undertaken without obtaining the community’s free, prior, and informed consent – the minimum standards set out in the United Nations Declaration on the Rights of Indigenous People (UNDRIP), which Canada has endorsed in words but not in action. The mining project also violates the community’s own environmental protection regime, the Trilateral Agreement, which was signed in 1991 by Barriere Lake, Quebec, and Canada and has yet to be honoured. The workers on site, predominantly Crees from the Mistassini and Oujebougamou First Nations, agreed to leave when the Algonquins traveled to the proposed mine location and explained their opposition to the development. The larger battle with the Cartier Resources, however, looms ahead. Barriere Lake community members will return to maintain a presence at the proposed mining site and stop all further developments. Please stay tuned for further developments and action call-outs. The community remains largely in the dark concerning the activities of the band council. Illegitimate in the eyes of most people in the community, this band council rose to power through the imposition of an Indian Act provision (Section 74) that gives the Minister of Indian Affairs discretion to overthrow Indigenous customary government systems. One thing is clear, though: Barriere Lake is open for business now. Mining companies, logging companies, and costly Hydro electrification and reserve housing development have all been green-lighted by the band council. While investments in reserve infrastructure are badly needed, they are coming at the price of burying the larger issue of land management of the whole territory. 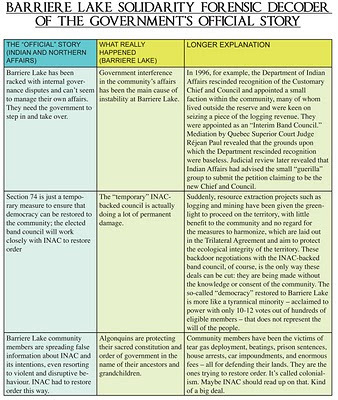 Hundred of letters have been sent through the Barriere Lake Solidarity website to Minister of Indian Affairs John Duncan in protest of the forced imposition of Section 74 on the Algonquins of Barriere Lake (see http://www.barrierelakesolidarity.org/2008/03/donations.html). The Department has recently sent out replies to these letters which are telling of Canada’s communications strategy to contain the threat of public awareness on the issue. Responding to these letters is Pierre Nepton, the Director General of the Quebec Region of Indian and Northern Affairs Canada (INAC). Nepton outlines the “official” story in his response letter: INAC had no choice but to reluctantly impose Section 74 due to internal conflicts over governance, which the community failed to resolve themselves. But it’s cool. 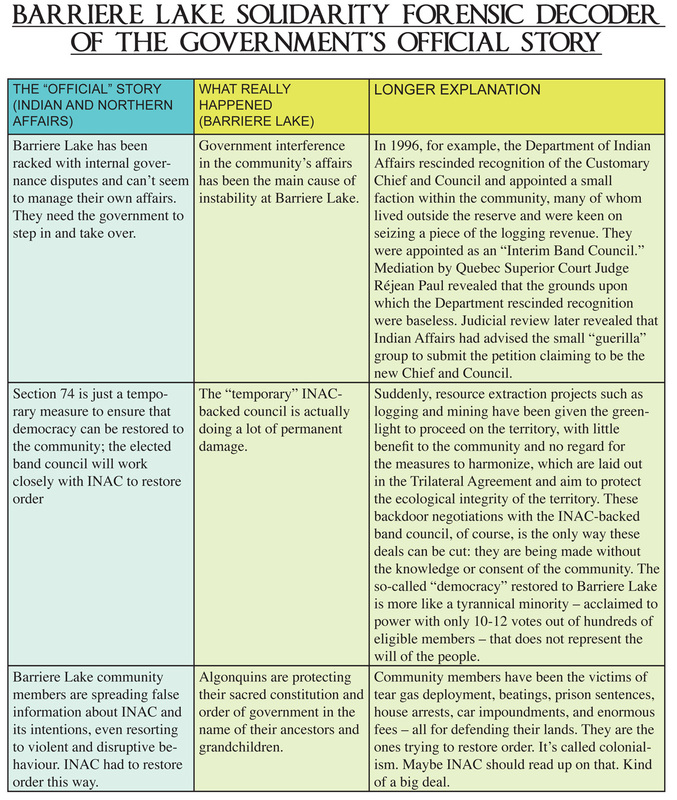 Barriere Lake Solidarity has prepared a forensic decoder of the government’s official story. Click on the below picture to see it in full.